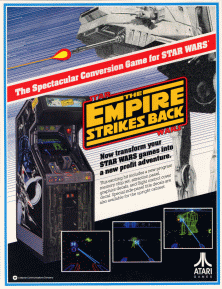 "It's a spectacular new conversion kit… a new profit strike for STAR WARS." Now you can transform your STAR WARS games into a new profit adventure. It's simple to convert either your opright or cockpit cabinets with this high-performance low-cost kit! It includes a new program memory chip set, attract panel decals and flight control cover decal. • Action follows key sequences from the incredible movie. • More play levels, plus choice of laser blasters or tow cables. • Players are challenged to achieve JEDI POWER by destroying a given number of targets n each level to accomplish the J-E-D-I spellout. • Flight controller allows expanded directional control for greater felling of flight. Players can also control their own flight path. 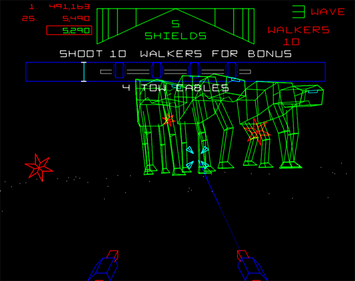 • New add-a-coin feature allowes continued play if player has achieved JEDI status in the previous game. • Operator-selectable options include four different numbers of starting shields, four difficulty settings and four options for J-E-D-I Spellout Bonus.